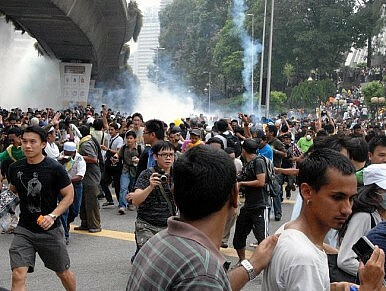 Police in Kuala Lumpur fire teargas to disperse thousands who defied officials to join an anti-corruption rally. Police in Malaysia’s capital have detained almost 700 protesters, fired teargas and used water cannons against tens of thousands of people rallying through the streets of the capital demanding electoral reforms. Protesters from Bersih, a group 62 non-governmental organizations and opposition parties, had gathered in downtown Kuala Lumpur intending to march peacefully through the streets. However, Prime Minister Najib Razak, who many expect will call an early election, declared the Bersih rally illegal and court orders had barred 91 opposition and civic leaders from entering the downtown area, where police had sealed off key roads. Pang Khee Teik, a local human rights activist and Bersih supporter, said government attempts to stop the rally had backfired by publicizing the event and that by drawing attention to the harsh response, many people who had not intended to join the rally were now marching. ‘They initially hadn’t planned to join the movement…(but) they are simply upset with what the government has done in its attempt to clamp down on this rally. So I would say the number has probably grown exponentially,’ he said. Police had no hesitation in opening fire with tear gas as crowds formed and attempted to march towards the iconic Merdeka Stadium, where independence was declared more than half a century ago. An agreement had been sought to use the stadium following royal intervention and what appeared to be the approval of Najib, who claimed he didn’t want to see a confrontation between Bersih and his own supporters who had planned a counter rally. However, the stadium’s management said at the last minute the venue couldn’t be used because repairs were being carried out. Protesters chanted ‘Bersih,’ meaning ‘clean’ in Malay, and Reformasi. Some wore yellow shirts. Others, fearing arrest, decided not to wear the colour synonymous with the movement. One man was dragged from outside the Chinese Maternity Hospital and kicked. Teargas was then fired into the hospital grounds where protesters had sought some respite. Bersih are demanding an end to vote-buying, measures to reduce fraud and equal access to media outlets for opposition parties during election campaigning. The next elections are not due until 2013. Information director for the chief minister for the opposition-controlled state of Selangor, Badrulamin Bin Bahron, was among the protesters and said large numbers of young people at the rally had undermined government claims that it holds the support of the nation’s youth. ‘They said they have the hearts of the youngsters, but no, the youngsters are with us and now the future of the country is in the hands of these youngsters, young men, young women – Inshala – it will make a change,’ he said. Many protesters complained that the response by Najib’s ruling United Malays National Organization (UMNO), which has ruled this country for more than 50 years, and the heavy hand of the law had made the situation much worse. Protester Leon Gomez, who marched with his wife and daughter, said organizers had intended to rally peacefully, but the harsh response by the authorities had made that impossible. Of the leaders who were banned from attending the rally, some did march at risk of arrest. Simultaneous rallies were also held in support of UMNO and the government to counter Bersih. Those rallies were allowed to proceed unhindered by the authorities. Malaysian Prime Minister Najib Razak says he plans to abandon the controversial Internal Security Act.